Chris Fischer and his grandfather Ozzie Fischer. New cookbook is tribute to land and family. My grandfather was ninety-six years old when he died. He tripped, a bucket of fertilizer in one hand and a shovel in the other, leaving him no way to break his fall. I saw the ambulance as I pulled into the farm with gas for the rototiller. At the hospital his surgeon told us, “Trying to repair Ozzie’s hip is like trying to put a screw into quicksand.” But we kept our hopes up anyway, until he fell again attempting to get back to the farm. Poppy, that’s what we all called him, passed away three weeks before the Agricultural Fair. He died at home with Gaga (my grandmother, Rena) and their four children by his side. We picked the flowers and vegetables he’d planned to enter then drove it all to the new Ag Hall and submitted everything in his name. He’d always won ribbons; they hung on his walls and filled drawers; he liked to use them as bookmarks. That August, Poppy’s farm, Beetlebung, won again, taking top honors for his proud shallots, plump blackberries and vibrant dahlias. Beetlebung Farm lies between Middle Road and South Road at Beetlebung Corner in Chilmark. It is nestled on flat land at the foot of pastured hills dominated by the Keith Farm. A small pond sits centered on the groomed acres framed by stone walls dressed in generations of lichen. Those fields and meadows, now in conservation, will remain as they are, which Poppy liked to remind me was not at all how they started when he began working for Mr. Keith in the forties. Poppy cleared then cared for those pastures, supervised the digging of the pond, and reconstructed the crumbling walls built a century before to hold sheep — when they outnumbered people on the island. It took him many seasons to get rid of the large oaks, then the brush, and finally the stones, until the grass could grow again. He never had the tools he needed; his tractor didn’t have a bucket for years, and when he finally upgraded, he got a machine with lights, which meant he could work at night. And he did, night after night, until he drove into a tree, smashing the machine’s headlights. After that he determined it was best to once again take the evenings off. He earned enough working for the Keith family to buy Beetlebung Farm from Robert Vincent in 1961. Although he had entered adulthood with a degree in agriculture, then spent half a lifetime farming, it wasn’t until Poppy was forty-six that he finally had land of his own on the island where his family had lived since 1670. He continued working for the Keiths, and on other properties around Chilmark, as he raised his family. He spent as much time as he could with his kids, and in his “spare time” he planted and tended his five-acre plot. Poppy put in the vegetable garden just outside his back door and sowed fields of wildflowers. His daughter Marie helped him plant and tend greens and vegetables in the larger fields. Cookbook is due out June 2. Poppy’s garden was always planted densely, first with peas, onions, and shallots, as soon as the ground could be worked. Then came beets, carrots, lettuce, and potatoes. 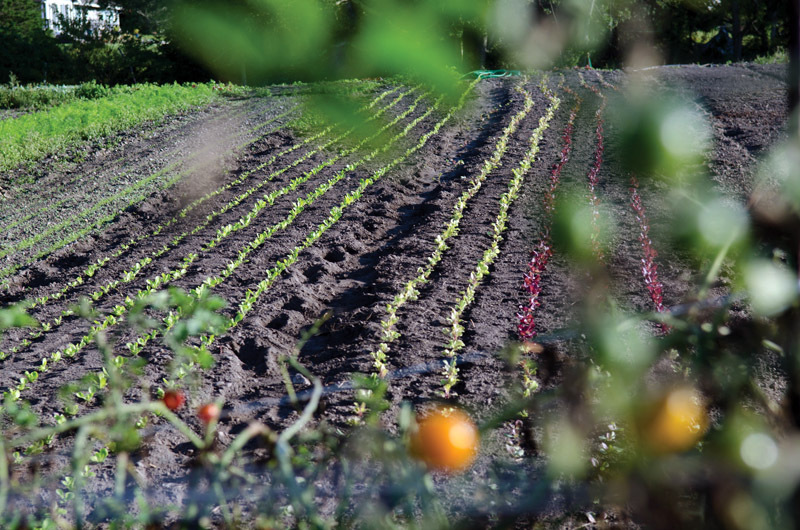 As the days grew longer and the crowds began to arrive, he would plant his beans, tomatoes, green peppers, and eggplant, the rows in the garden supplementing those in the field. He got his tomato cages ready early, all neatly lined up like soldiers, months before the plants would go into the ground. Then began the countdown of days until his vines boasted ripe beauties. Anticipation, he often said, was his favorite part of farming. For his eightieth birthday Poppy got a new tractor. Gaga drove it down the driveway, presenting her husband with the well-planned surprise, a small orange Kubota with an automatic transmission. It was the perfect tractor for him. But the shiny new machine didn’t replace his old wheel hoe for smaller jobs. Before the weeds could take hold in his aisles, he’d scratch away at the soil, gripping bicycle handlebars attached to a large wheel, metal prongs hanging off the back like the talons of a red-tailed hawk. He always spoke to his plants, sometimes gently and sometimes not. 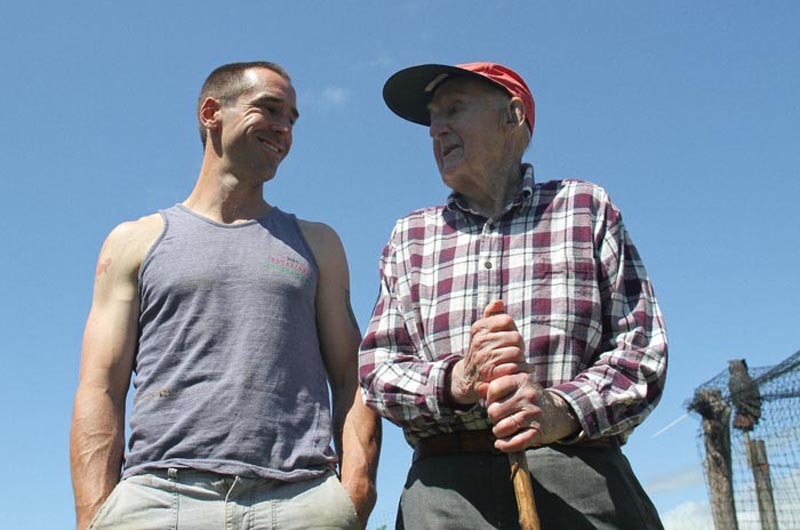 Over the course of his life as a farmer, many decades cultivating different patches of earth, Poppy created a language and he used it to tell his plants his hopes and expectations, always confident of their response. He famously yelled at a rose bush one summer for not flowering, bringing to mind an agrarian Billy Martin (although he lived in Red Sox country, Poppy always kept the radio tuned to Yankees games). He threatened to cut down the “damn thing” if it didn’t start blossoming. After that Poppy boasted, “It bloomed every year.” It still does. Poppy worked Beetlebung Farm for over fifty summers; the topsoil deepened and enriched each one of those years. He and Gaga always woke early and had breakfast as he scanned the sports pages of the Globe and she watched the news with the volume off. When their coffee cups were empty, he’d lace up his boots and, rain or shine, head out to the garden. He moved slower as his aches and pains grew, and grudgingly carried a walking stick when his balance betrayed him, but out he’d go, long-brimmed cap on his head, diligently off to work. Gaga loves asparagus. She likes it best cooked in butter and served on toast. I helped Poppy plant a new row alongside his established crop the year before he died. I dug straight enough to satisfy him, using a long string tied to rebar on each end, pulled taut to keep it true. He supervised from his lawn chair. After we planted, Poppy confessed that he’d let the asparagus plants know he wasn’t sure how much longer he’d be around. He’d spoken up, he said, so they’d get to work. The plants answered. The next spring we harvested especially stout and delicious asparagus. We ate them together, mostly on toast. 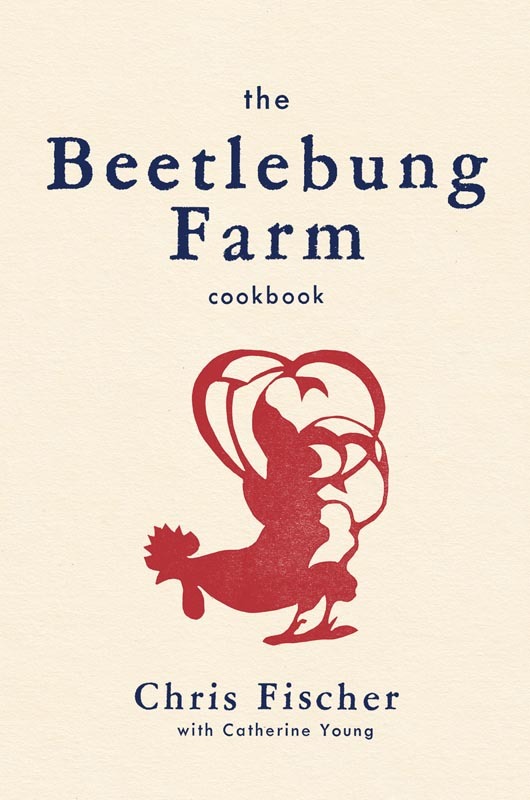 The above essay titled Poppy’s Farm is excerpted from The Beetlebung Farm Cookbook, due out June 2. It appears courtesy of Little, Brown and Company, copyright © 2015 by Chris Fischer. Another gorgeous essay on what graced your life. Your grandfather's relationship with the earth as well as the Yankees made me smile. Beautiful tribute to a life well lived. I like the way a writer's heartfelt emotions permeate their choices, topic and word and rhythm, when the subject is beloved. And I recognized myself with a start when I read, "Anticipation, he often said, was his favorite part of farming". Such a beautifully written piece gracefully linking us to a life and to the the land on which it was lived. What a nice tribute, Chris. When I was little I loved to arrive at Beetlebung Corner as my Dad's truck approached our destination at Squibnocket Farm where he would be working for a few weeks. It meant I was nearly there and I could read that big word: Beetlebung! Thank you for the nice essay about the owner of Beetlebung Farm. Beautifully written~ this speaks of what I love most about this island, it's sense of timelessness. Thank you for sharing this with us. Beautiful tribute to both a grandfather & to a cherished way of life. A wise man - anticipation is the best part of most things. It's a very loving and keenly observed portrait -- thanks, Chris. So lovely. Can't wait to read the book in its entirety. Congrats, Chris! A lovely tribute to a beloved couplle, both Rena and Ozzzie. Thanks you, Chris. This is why we love the Vineyard, and as well why we love the Fischer family. So very moving Chris ! I am heading back to my 4 Acres with great "anticipation". Not being able to sleep I crept over to Facebook, not expecting to be embraced by such a literary description of something I too am passionate about. I didn't know your Poppy, but I know what he loved. I relish every trip to Chilmark and I pray that a piece of grass fed lamb is in the Beetlebung freezer so I can have a chance to play in the kitchen. thanks Chris. I loved reading the story of your family farm and now can see where Marie gets her love for plants. While I was visiting the Vineyard 2 summers ago, I had the pleasure of meeting your grand-mother in her home with Sally Cook, my father's (Prescott) first cousin and had a very nice conversation with her. She's lovely! Martha's Vineyard has always had a special place in my heart and reading your essay brings back all the smells and souvenirs! Very nicely written Chris, I loved your Grandpa, every time I ran into Ozzie we would have a long discussion about trees, especially Giant Red Woods,he liked to talk about the one he planted on the North side of the garden. Anything that grew out of the earth he was an expert on, and his feet were firmly rooted in that same earth! I miss those conversations, Chas. Thanks for sharing the memories and bringing back those of a special old guy in our life who also spent a bit of time talking, not so gently, to his plants. We're so fortunate to have had people in our lives who've left this type of impression.